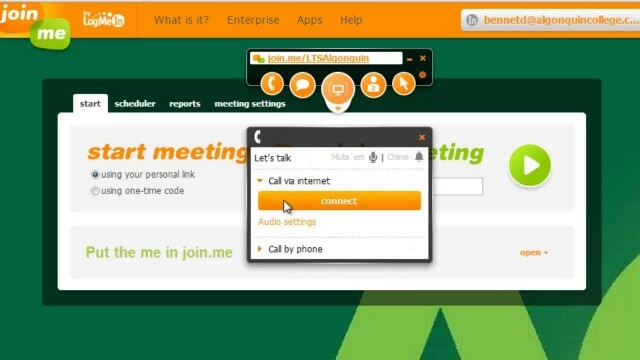 This software is recommended for businesses, even if it’s not a pioneer in this category (WebEx by Cisco has the best solutions for web conferencing), but after years of working to improve its features, the developers managed to make Join.Me Pro a fast growing collaboration solution. Internet calling and Share control. The Pro version, which we’ll talk about in this article, costs $19.99 per month, but it allows video conferences with up to 50 members, it offers 10 video feeds, screen and window sharing, unlimited whiteboards on iPads, 5GB of cloud storage, and the rest of additional features include: unlimited audio with international conference lines; recording; meeting tools (annotation, presenter swap); meeting scheduler with Outlook plugin and Google Calendar Plugin; customization (personal URL & background); Meeting lock; One Touch Meeting (only for iPhone and Apple Watch); reporting; it includes stand-alone audio and doesn’t display in-meeting ads for viewers. The Enterprise plan costs $25 per month, it allows up to 250 members in video conferences, and besides the aforementioned features, it offers 5TB of cloud storage, user and group management, policy and permission management, Enterprise authentication with single sign-on and Salesforce.com integration. There isn’t much to say about JoinMe.Pro’s design, as it’s very simple and you won’t encounter problems when trying to figure out how it works. When starting a meeting, you will see a black rectangular bar and some orange icons will pop up, but it also contains the access code, which will be needed by the participants to join the conference. You will send this code to them via email or Facebook, or using any other methods. To have access to the pull down menus, you will need to click on one of the four circular icons, and no matter how long you’ll run Join.Me Pro, your device’s battery, in case you’re using a mobile device, won’t be affected much, because the software is very light. However, it doesn’t have the best audio and video quality, but you won’t have big complaints either. The participants to your meeting will be shown in small bubbles and you will have the option to move the group around the desktop or to place it in the center, to make room for other applications. A minor complaint can be against the rectangular bar, because when going through the web or through some documents, to return to this bar, you must click out of everything. And once you start doing something else on your device, you will forget that Join.Me is running, but after a period of inactivity, the session expires and you will need to login again. In case you enter a wrong password, you are notified on your email. You will notice that when you’re video chatting with a person and if he or she takes a short break to take care of other online activity, when returning to the Join.Me tab, the software sees him/her as a new guest. However, this problem wasn’t reported by those who are using mobile devices and other browsers than Chrome. Also, when sending files to yourself it takes less than 1 minute, but when sending the same attachments to other participants to the conference, from time to time, you will get some errors, saying that the files can’t go through. So, why should you use Join.Me Pro? First of all, it has a smooth and efficient screen sharing option and the chats are sent without any delay. You can easily navigate throughout Join.Me Pro, the video chat feature is good enough, and the users have another option: to mute or unmute themselves, by clicking on their own chat bubble. What are Join.Me Pro’s faults? The software needs more improvements, because it’s not a pro tool yet in terms of video chat functionality. There are problems when some of the 50 participants are minimizing and reopening the videoconference tab, because they are mistaken for new guests.